The CIO role can be a lonely place at times with not much written about it other than its demise or difficulty breaking in to the highest echelons of the corporate structure. 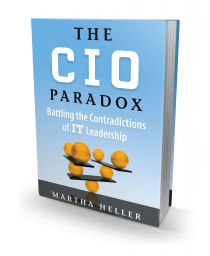 The CIO Paradox by Martha Heller changes that and has instantly elevated it to one of a handful of books I recommend as a must have reference book on every CIO’s bookshelf. This book breaks the mould and not only enthuses you with an amazing amount of knowledge and case studies from other CIO’s but it also challenges your current strategic reasoning through its elegantly structured paradoxes. It drives straight to the heart of the CIO role, openly discussing (with real world feedback) ways in which you can improve yourself/your IT organisation but it also takes the time to highlight ways in which you identify, nurture and manage talent within it. It is well researched and Martha clearly knows her topic well having written about and engaged with CIO’s for many years. My only reservation about the book is that the level of CIO’s that contributed to it errs on the larger corporate but this certainly shouldn’t detract from the lessons contained within that CIO’s from companies of all sizes can learn a considerable amount from. 2. YOUR STAKEHOLDERS: WILL THE BUSINESS EVER LOVE IT? 4. YOUR FUTURE: WHAT’S NEXT FOR THE CIO? I’ll break out a small portion of the first challenge with some of my own reasoning. As CIO’s you are hired to be strategic and innovative. The stark truth is that you can spend most of your time on operational issues and whilst being the steward of risk and cost containment it can also be difficult to innovate. This section quickly revs up and breaks in to the cost versus innovation paradox. Regular readers of my blog will know my drive for innovation within the CIO role and the need for the CIO to add REAL value to the business through it but this must not be done without first stabilising the ‘run’ side of the IT organisation. Running before you can walk is the death knell for many an IT leader, with the mantra here being that you must earn the trust and respect of the business in the stabilisation of the IT organisation before you move on to the chunkier, more innovative projects. The most successful CIO’s (the ones who have broken the paradox) are those who do more than apply IT to business problems. CIO’s who have broken the paradox take the expertise that they have developed in their role as leaders of the IT organisation and use it to make improvements across the enterprise. They are company leaders, in addition to being IT leaders. You must speak the language of the business, building relationships with business leaders, being a business leader first and a technologist second. Whilst a huge group of CIO’s get it and are bona fide business leaders, another huge group does not…. When you think through the various paradoxes that are broken out across the book, many of them really resonate and delve in to the essence of the CIO role. Each of the four main sections and resulting paradoxes will be graded differently in importance for each CIO that reads this book but I’m sure that we will all appreciate every one of them just as much. The key strength of the book is exactly this and proves that not only does it cover in great detail a wide spread of the main issues facing a CIO in executing their role but its elegantly crafted paragraphs mean hardly a word is wasted in doing so. When you work through the book you find yourself nodding in appreciation and making notes in the margin (and in my case putting index markers in to mark key pages). The simple conclusion is that this is a must read book for every CIO. Its going to be a well thumbed reference point for me that will stimulate my thoughts and interchanges with others for a long time to come. Christian, thanks again for reviewing my book and for your very kinds words in this review! “The trouble with the concept of aligning IT to the business is that it assumes IT is subservient to the business,” says Nick Colisto, CIO of Hovnanian Enterprises , a nationwide home builder and author of “The CIO Playbook.” According to Colisto, IT leaders need to create a plan that gains them a seat at the executive management table, not the least of which is building business cases that promote the value of IT to rest of the business. “Don’t look at business executives as customers, see them as equals,” says Colisto.